Diphenidol hydrochloride is a muscarinic antagonist employed as an antiemetic and as an antivertigo agent. Benzetimide hydrochloride is a muscarinic acetylcholine receptor antagonist. Fesoterodine Fumarate is an antimuscarinic agent and is rapidly de-esterified to its active metabolite 5-hydroxymethyl tolterodine that is a muscarinic receptor antagonist. Piperidolate hydrochloride is an antimuscarinic, inhibits intestinal cramp induced by acetylcholine (rats and dogs). 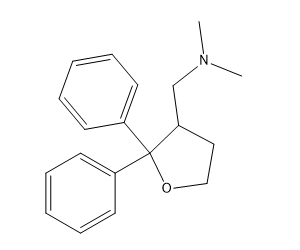 Scopolamine hydrobromide is a high affinity (nM) muscarinic antagonist. 5-HT3 receptor-responses are reversibly inhibited by Scopolamine with an IC50 of 2.09 μM. 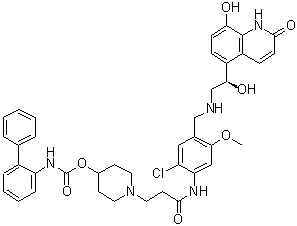 Batefenterol (GSK961081;TD-5959) is a novel muscarinic receptor antagonist and β2-adrenoceptor agonist; displays high affinity for hM2, hM3 muscarinic and hβ2-adrenoceptor with Ki values of 1.4, 1.3 and 3.7 nM, respectively. 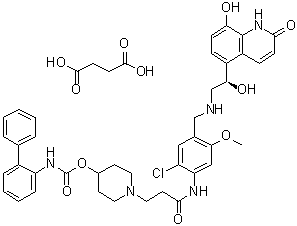 AVex-73 acts as a muscarinic receptor and a moderate sigma1 receptor agonist.